TP Pinout Selector v1.1.0 is a small application for windows computer which allows you to check out the Test Point Pin of various Android Smartphone and tablets. 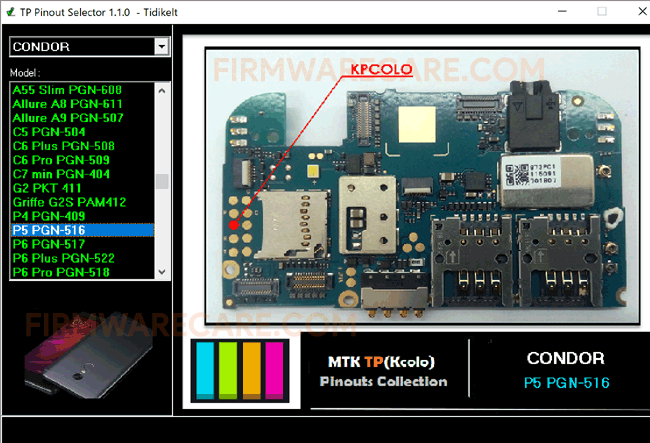 TP Pinout Selector v1.1.0 supports majority of Android Device running on Mediatek Chipset including the brands like Condor, Doogee, Iris Mobile, Lenovo, Logicom, Qmobile, Samsung Clone, Tecno, Wiko, ZTE Smartphone and Tablets. It also supports Android Devices running on Qualcomm Chipset including Xioami and Huawei Smartphone and Tablets. In order to use the Test Point Tool, you need to install it on your Windows Computer. Once you have successfully installed the Tool, Launch it. After Launching it, Select your Mobile Brand from the Drop-down menu and then Select the Device Model name. [*] Compatibility: The TP Pinout Selector v1.1.0 runs perfectly on Windows XP, Windows Vista, Windows 7, Windows 8, Windows 8.1 and Windows 10 (32 bit and 64 bit). [*] Credits: TP Pinout Selector v1.1.0 is created and distributed by Tidikelt (developer). So, full credits goes to Tidikelt (developer) for sharing the tool for free.